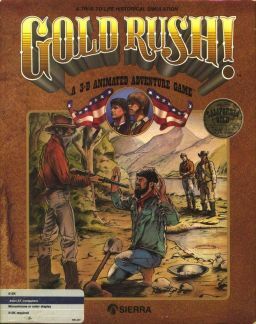 Gold Rush was an adventure game developed by Doug and Ken MacNeill using Sierra's AGI engine, which was released in 1988. Sell your home in New York and head out to Gold Rush-era California to strike it rich. The Gold Rush rights belong to The Software Farm, the company owned by the MacNeill brothers, who re-released the game in 2000 with copy-protection removed. In addition, Gold Rush Anniversary, a high definition remake with high definition art, music, and voice acting, was released by Sunlight Games on November 7, 2014. Both Gold Rush Anniversary and the 2000 re-release of Gold Rush Classic are available to purchase digitally online. The AGI versions of Gold Rush are now supported by ScummVM, a program designed to let 2D adventure games run on multiple platforms. With ScummVM, Gold Rush now runs on modern versions of Windows, as well as Linux, Mac OS X, and many consoles such as Dreamcast, Wii, PlayStation 2, and PlayStation Portable. For a complete list of platforms supported by ScummVM, see here.